The techniques used in Animal training. One day you go to the mall. Everything is different; garlands and bells are all over the place. Everything is out of place and weird music blares instead of lulling muzak. Then… trusted adults urge you to go with a person looking like Peter Pan (that guy steals children!). He/she leads you to a man in obvious disguise – that beard is SO FAKE (and maybe he smells a little like stale cigarettes and/or booze). Then… he offers presents!!! Your reaction? Much like many other children during their first picture with Santa Claus. Full on crying. This guy is terrifying! After a year or two, what happens? Mall dressing, and Santa Claus are precursors to what? Some of your favourite things; Grandma and Grandpa coming to visit, the food; or, more likely, boat loads of presents. Santa Claus predicts Christmas. Seeing this man has now turned your feelings from abject terror to the warm fuzzies. Now you just have to worry about those clowns…. Classical (counter)Conditioning and Desensitization are important in dealing with fear or otherwise upset dogs. Diminishing upsetting emotions often eliminates “bad” behaviour in these dogs. Unlike suppressing the behaviour; akin to smacking a child when they are on Santa’s knee crying. They might stop crying, but isn’t going to make them feel any better about Santa — now Santa may mean abuse, or that fear might transfer to the person who slapped them, or candy, or muzak….. Fear is hard to eliminate. Time and high magnitude positive associations are required. People with fear of insects are constantly bombarded with insects; kids are only bombarded with Santa Claus once a year. Insects are creepy crawly and icky with no redeeming qualities (don’t bother trying to convince someone afraid of bugs of all their benefits). Santa Claus, although a strange man in disguise tempting children with goodies, brings exactly that – goodies, presents, chocolate and/or family. To turn garbage trucks into Santa Claus, you could ask the truck to stop and let the dog rummage in the garbage; not a good idea on so many levels. So we play Santa Claus. Distant garbage truck noise and visibility are like decorations; not scary, but present. Close proximity to the garbage truck? Entering the gates of Hades. Rearrange things so noise and visibility means a flow of chicken/steak/stinky cheese starts (Here comes Santa Claus!) — “maybe this thing isn’t so bad if it means a smorgasbord.” Garbage trucks will mean Santa Claus (with enough repetitions and careful timing). Simple sits and other basic obedience behaviours could be considered preschool or Kindergarten level (1 or 2 out of 10). Some basic impulse control exercises – stay, wait, leave it – might be grade school. Complex tricks, sports or other activities may be high school or even university level. Dealing with emotions can easily be PhD level (9+ out of 10). Living with fear can’t be pleasant. Modifying fear is best attempted under the care (or help) of competent, skilled and steady nerved professionals. Make sure your trainer understands how a dogs upsetting emotions may be affecting their behaviour. Fixing the emotion (fear of Santa Claus) can lessen the behaviour (crying). Using Energy in Dog training? Numerous mystic words can be found when dog training is discussed; words like “Energy”, “Dominance”, or “Pack Leadership”. Talking of “Energy” is problematic. Like it or not, I use energy. Not “Energy” as others might use, but energy nonetheless. Cellular Biology gives us the understanding of basic energy in animals (as well as plants, fungi and some bacteria). All of these use the Kreb’s Cycle to produce basic energy to power cellular processes. The net process of these reactions is ATP (Adenosine Tri-Phosphate). ATP is used by cells to power other processes. Extrapolating from that point backwards, where does the energy come from? Sugars are converted to smaller compounds which form primary metabolic units needed in the Kreb’s Cycle. Proteins, Lipids (fats), and other carbohydrates are also mostly converted to sugars. Sugars, Lipids and Proteins come from food. To survive all animal cells need inputs of oxygen and food. Extrapolating forward, food provides energy which then flex muscles and fire neurons. Food powers cellular processes needed for cellular life and thus the whole organism. Other types of energy are either a subset of this energy, or mystical “Energy” that cannot be measured, is non-existent, or used to cover up the actual method of training. Everything in a multi-cellular organism requires the basic processes powered by food to live. In order for an animal to move, think, digest, sleep, breath etc. they need food. Cellular energy is the basic unit of all other energies in an organism. Neural impulses function off this energy. They fire muscular contractions, which also use cellular energy. So to get a dog to sit, the first need is food to power the impulse and then the contraction. Oxygen is delivered from the blood, which is created in the bone marrow (cellular division requires cellular energy) and the blood is pumped by the heart, a muscle that requires cellular energy to contract the muscle fibers. All in all, animals need food to function. Fear, pain, discomfort, enjoyment, fun and love (to name a few) require, at a basic level, cellular energy. Other types of “Energy” cannot provide an animal with the ability to move, think or even digest. “Energy” usually means some mystical connection between trainer and dog. Is a possibility of ESP, Telepathy or other mystical force real? Science cannot and has not in 3000+ years measured or proven the existence of these mystical forces. Usually other means are being used being used involving food, discomfort or even pain. Using the term “Energy” does a disservice to pet parents attempting to determine the method best for their pet. So animals needs food to survive. Use of food seems to make the most sense in training. Not only is food something an animal needs, but most animals actually like food! (a built in evolutionary advantage-if you don’t like food, you don’t survive) Shunning food, for training shuns the very energy dogs need to survive. Denying food for training should lead to a question. What is being used to motivate the dog? Motivation is important. Organisms seek to survive, procreate and thus pass on their genes. One key aspect to survival is getting food. Another key aspect of survival is avoiding danger. These are the main forms of motivation – getting good stuff and avoiding bad stuff. Most talk of “Energy” is a mask for the later, rather than the former. Motivating with bad stuff has bad potential side effects. Covering up bad side effects with a term sounding comforting should be considered irresponsible at best, negligent at worst. Imagine a teacher saying that they use their “Energy” to train 5 year olds not be bullies; they then attach a noose around Johny’s neck and yank every time he kicks over someones sand castle. They claim they aren’t hurting the boy, because he’s respecting their “Energy”. They neglect to mention that the real (physical) energy they’re transferring could actually damage Johny’s neck, not to mention physiological trauma. Such a teacher would at the very least be fired. This is not uncommon in dog training however. Being aware of what is actually being used as a motivator is important. Using Energy in Dog Training? Use food. No One Way To Train Dogs. Positive Training is not “one type”. Dog owners, and even novice trainers are often befuddled by all the information about on dog training. The Science is Misdirected, obfuscated or misunderstood. Some professionals doll out the misinformation as fact. A lot of solid, scientifically sound information often getting overrun by the din of the poor. 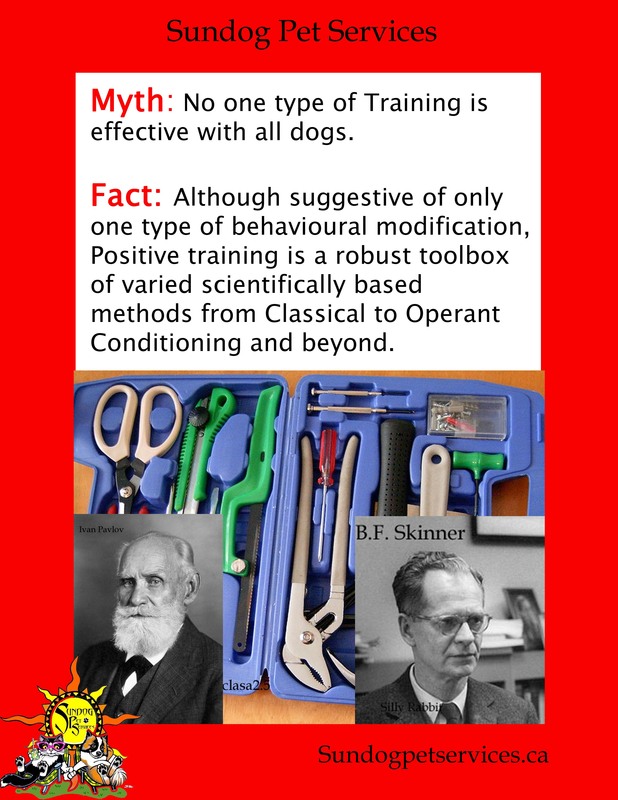 One of these misunderstandings is over one single line; “There is no one way to train dogs.” The implication being one group of trainers uses only one method to train dogs, while the other side uses all methods. While Force Free and/or Positive Training (FF/PT) methods suggest only use of one method available in modern dog training, in practice and theory, Balanced Training seems to use only a small sliver of available tools used in 21st century dog training. Previous centuries did use the science of Training, but not with the nomenclature of the science. Folk knowledge was passed from generation to generation. Modern dog training uses Operant Conditioning (“If I do X, then I get/avoid Y.”) and Classical Conditioning (“If X happens, then Y follows”). Also available and understood by good practitioners is management (enuring dogs can’t rehearse undesired behaviours) and antecedent arrangement (ie. ensuring the environment isn’t overpowering training). They are not always mutually exclusive. Management and Antecedent arrangement are often fundamental to make Operant conditioning work well. Not removing chances to perform old “bad” behaviours and not dealing with competing motivations sets the dog up for failure. Asking compulsive gamblers to attend gamblers anonymous meetings in the middle of a crowded casino is a recipe for failure. Asking a chronic shoe chewer to play with a different toy while a flock of shoes is around is also a recipe for failure. Throwing an arachnophe into a dense, spider filled jungle, without preparation before hand, is a recipe for failure. Making a dog encounter a stressor to stop a reaction is a recipe for failure. Classical conditioning always occurrs in the background of operant conditioning – (“Pavlov is always sitting on your shoulder.” – Bob Bailey). Ask a dog to do something; they get it right, and get a good thing starts adjusting emotional states positively. They begin to think the asking means something good will happen. The opposite is aslo true. If asked, they don’t perform, and something bad happens, association with that bad thing can occur (or sometimes with the person asking, or some other thing in the environment – fear is fickle!). Understanding science helps counter these effects or use them advantageously. Good, competent Force Free/Positive Reinforcement practitioners use all of these mentioned and understand when to use one over another. They do not rely on just one portion or method. They do however, avoid the use of aversives in operant conditioning. Meaning they do not employ or avoid fear, intimidation or pain. Mostly this is an ethical choice, and increasingly is being backed by solid, current science; although pain and fear may work, the side effects can be to detrimental, and are avoided. Balanced training uses operant conditioning. Whether just by the use of the associated language, misunderstanding of scientific fact, or from lack of knowledge, little outward acknowledgement of other modern training principles. When dealing with most aggression, the answer is “deal with the behaviour.” “If we don’t do X, the dog will die”/”If we don’t use X, we won’t get a good recall” In order to fix the behaviour, they need the behaviour to happen. This means putting the dog into stressful situations, then correcting the dog; corrections often of an aversive, punitive nature. “Pavlov is always sitting on your shoulder” here means dogs can potentially associate aversives with the trainer, the stressful trigger, or something completely unrelated instead of the actual behaviour. This does not mean that balanced trainers do not use food, fun, play to achieve some of their goals. They seem to use operant conditioning without apparent consideration of the possible side effects. Arguments against management and antecedent arrangements are often prevalent in balanced training. “You can’t arrange real life” is sometimes true; but as much as possible practitioners can seek out situations where arrangement is possible until the dog understands – then the situations become manageable by the dog in time. Learning how to deal with a problem with more than one tool available is what any good trainer in the future will do. There are times when management is necessary, and sometimes the only recourse such as walking a truly aggressive dog with a poor mouth only with a muzzle. Trying to deal with just the aggression, with no management is poor, and dangerous, practice. Arrangement ensures success is more likely with both operant and classical methods. Eliminating aversives does not make operant conditioning weaker, but increases the potential welfare of the animal by eliminating negative shifts in emotional states. What does it all mean then? You take yourself to the doctor. She mentions that the cut in your arm is infected. She elects and strongly encourages amputation! This will ensure that the infection doesn’t spread. You will be back at work in a few days with no other physical harm. Antibiotics or possible psychological effects are mentioned. We all know that this is silly, but the analogy is not far off from what some people experience. A broad base approach proves there is only one way to train dogs – Force Free and Positive Reinforcement Training currently, while a narrower approach encompasses dangers and potential negative welfare states for dogs. Systematic, scientifically sound training with standard procedures for the most common behaviour modification is essential. Eliminating, or managing potentially harmful outcomes increases positive welfare states. 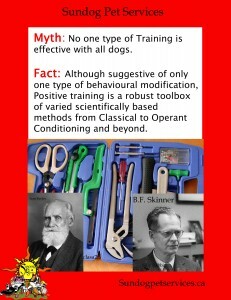 Trainers become trainers partly because they want to be good to dogs. Lacking correct, science based learning though, this can be corrupted or misused. When this happens, welfare can suffer; counter to what was actually intended in the first place! So what are owners to do? Ask questions. Make sure clear, concise answers are given. Something akin to this. Currently no legal regulatory body governing exists for dog trainers; anyone can hang out a shingle and do nearly anything to your dog. Advocate for your dog; if you don’t like what is happening, or you wouldn’t practice that way yourself or on any other animal or child, stop the training. Why am I admitting this? I happily strive all the time to be more and more of one. The main use of food in my training means, to some, that I’m just a bribing cookie-pusher. Bribes come before; calling a lure a bribe is disingenuous. Lures are removed as quickly as possible and replaced with a cue after which you Rewards (Reinforcement). I use Food Rewards, not Bribes. Using food as the primary tool in my training tool belt can be problematic at times but if a dog doesn’t work for food, I have options. I don’t use Pain, Annoyance, Intimidation or Fear. So, because I’m not using all the scientific tools in my toolbox, I’m not “balanced”. The corollary must be that I’m unbalanced. I’m ok with that. Why? Because the side effects from using the other tools aren’t worth the risk. “What about dogs that you have no other choice but to use a heavy hand on otherwise they will be destroyed?” Ah, yes, The Straw man argument; there are always choices. Either ignorance of the science behind training or just a blind justification for using force. Advocating for Positive Training (and DS/CC [Desensitization and Counter Conditioning]) and not using tools/techniques having unpleasant, or difficult to control, side effects makes me an “extremist”. Use of DS/CC and R+ for modifying EMOTION of fearful and reactive dogs has a proven track record. If done competently you don’t need to use force/pain to alter BEHAVIOUR. (looking only at the behaviour of a reacting, emotionally distraught dog does disservice to the dog). So am I an “Unbalanced, Cookie-Pushing Extremist”? I prefer to see myself as “Enlightened, Ethical and Cutting Edge” (even though some basics are over 100 years old now). The public deserves transparency to make an educated decision about what methods are used on their dogs. Positive training has side effects too, but most of them involve dogs actually liking people (people mean good things – because of that pesky Classical/Pavlovian Conditioning thing).